In part I of “Know your H2O Gravity” we stressed that every individual body is unique and reacts differently to the gravity properties of water, and that why this is true is not as important as how we use this knowledge. What we are working on with the senior group over at Bernal’s Gator SC are very simple buoyancy drills. The goal for the athletes is to learn to move and stabilize their bodies in different positions. The key to success here, however, is to do this WITHOUT using your hands and feet to reach each position. Mastering your own personal water gravity and being able to use this knowledge to your advantage while training and racing depends on your ability to make slight adjustments with your core. For this topic we will define the core as the area from the top of your head to your hips. Since your hands and feet will/should be actively occupied while swimming with pulling and kicking, they are not useful for body position adjustments while racing. This is why we don’t allow the swimmers to use them in buoyancy drills. 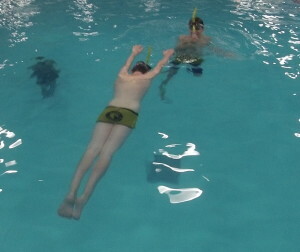 Here are the positions we have been using and, as you will notice, we use a snorkel so they don’t have to worry about getting air and can focus solely on the movements. Stabilizing the body in an upright position. Stabilizing the body w/back of neck and hips on surface. Stabilizing the body w/back of neck, hips and heels on surface. These are just random pictures taken as we were working on buoyancy last night. What we emphasize with the kids is to NOT use their hands or feet to move your body into the proper positions, but just their core. 1) Position your body into the Pencil using just your core. Make sure that you are upright and your arms are pinned to your side and not used to maneuver yourself. Always explore your buoyancy by moving out of position and back into position using just your core. 2) Once stabilized in the Pencil, defined by being able to stay there for 30″ to 45″, proceed by moving from Pencil to the Egg. Make sure that your movements are as smooth and slow as possible. We do not want to have any jerking movements. Again do not use hands and feet to move, but use core and the slow movements of your arms and legs. 3) Once stabilized in Egg, with the ability to stay there for 30″ to 45″, start moving slowly to the Prone position. There can be many variations of these simple drills. We always ask the swimmers to experiment in each position by moving themselves out of position and then discovering what gets them back into the proper position. The more they learn how to “right” their bodies the better. The whole process is one of adjustments and corrections. Learning how each of their bodies react in the water. The advanced versions we use are altering the Prone position into a Prone “Y” and Prone “X”, where their arms and legs make the corresponding letter on the water in that horizontal Prone position. As always, make it fun! Most human bodies react similarly to “land gravity”. Some may “fly” through the air better than others, but for the most part, no matter how high or fast they climb…physics has taught us that eventually they will come crashing down. However, in the water bodies are VERY different, and the body works and rides through water very differently than it does on land. Sounds simple, but this is a topic we coaches need to ALL understand better. 1) It IS personal. All bodies have different buoyancy ratios. There is no need, in my opinion, to ask why this is. Just consider it a given in our coaching book of rules. 2) Teach your swimmers how to know their personal water gravity variables. All swimmers need to know how their bodies float in different positions. This is very important for them to know how to correct the body position in workouts and races when it is crucial. 3) Bad body position WILL slow you down. Nothing can overcome a body that is not in it’s most ideal position to move that specific body forward in water. Ok… Great… How do we do this? How can you teach your swimmers, or yourself for that matter, to become more aware of how their/your body moves through and reacts to the water best? Ahh, now comes the learning part! To teach something you MUST learn it, understand it and know HOW to teach it correct? We are working on this skill set right now with a group of kids at Bernal’s Gator Swim Club in Boston! In part II, I will add some of things we are working on, and most importantly WHY we are doing what we are doing! Let’s begin to learn how we learn! Humans are capable of developing high levels of ability and efficiency in a wide range of skills. So what does it take to become a highly skilled performer? First and foremost it is important to understand how we learn. When we attempt to do new things, the brain begins to work, both consciously and subconsciously, to connect all of the brain cells (neurons) responsible for performing that skill. The stimulus of trying to perform a new skill causes the brain’s cells to interconnect with one another in order to exchange “information” necessary to the performance of that task. They do this by sending out new “feelers” known as axons. These axons begin connecting with one another and thus creating new neural connections. As the task is repeatedly practiced the brain “insulates” these connections with a substance called myelin. Myelin causes the connections to exchange information more rapidly…..the more myelin, the greater the skill level. The more you practice the skill, the more your brain remembers and sets that skill in its memory. A great example of how this works is learning to ride a bicycle without training wheels. Some basic skills are developed when learning to ride a tricycle and then a bicycle with training wheels. 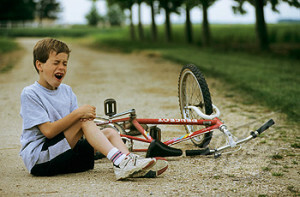 Once the training wheels come off the next new set of components are added. Many kids struggle with the process of “figuring out” how to ride the bike without the training wheels. Some even get injured in the process. This year I met a young boy who told me he spent a week in the hospital due to an accident that happened when he was trying to learn how to ride his bike. I asked him whether he ever learned how to do it. After all, he had injured himself and the easy thing would have been to quit trying. He replied that he did learn. So I asked him “If you injured yourself so badly why did you continue to try to learn?” His reply was that he didn’t want to be the only one riding with training wheels. In other words, he didn’t want to get left behind. When you struggle with learning a new skill, remember….you learned how to ride a bike without training wheels, you can do this! Don’t get left behind! Today’s news brings the addition of the widely respected and accomplished Jim Richardson as a site contributor. I have been blessed to be able to know and work with Jim doing a coaching “exchange program” per se during the summers of 1995 and 1996. I spent that time in Ann Arbor working and watching how both he and Jon Urbanchek ran the highly successful Michigan swimming program while explaining to them how we ran our sprint program at UC San Diego. It was one of the most valuable learning experiences as a young coach to better understanding middle and distance training philosophies. “I am excited to join Doug Boyd and Swimfever.com in the effort to create a place where we can discuss both old and new ideas to enhance learning and skill development. Prior to my 30 year stint as an NCAA swimming coach, I taught high school and coached age group swimming for 9 years. While it is certainly exciting to work with Olympic and World Championship swimmers, for me, it is just as exciting to watch a young swimmer grasp the concepts behind technical improvement. Once they understand the “why and how”, they are more likely to experiment and discover what works for them. Jim’s contributions will begin tomorrow with his thoughts on how we as human’s learn.